Bournemouth Borough Council: Pure Town Planning are delighted to announce that yet again, in conjunction with ARC Architects, we have recently secured a very valuable planning permission for a 34 unit residential development in Cromwell Road, Pokesdown. 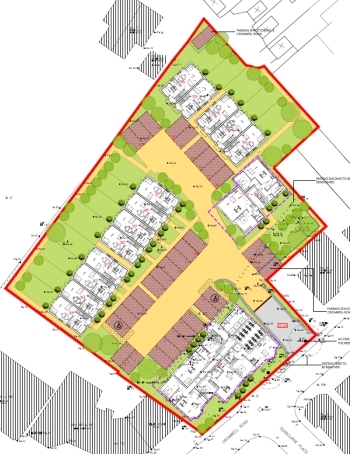 The approved scheme involves the demolition of industrial warehouses and offices which have been vacant for many years in the heart of Pokesdown, and to build an attractive and comprehensive residential scheme consisting of 13 houses and 21 apartments. The existing warehouse and office buildings have become an eye sore on Cromwell Road and are in a state of continuing disrepair which contributes little to the character and appearance of the Cromwell Road area. Although the site is ideally placed in close proximity to a range of public transport and services, due to its built-up location, the site is surrounded on three sides by neighbouring residential development of various density and scale. As such, the key design elements incorporated by ARC Architects involved maximising the site’s potential for the applicant, while also ensuring the proposal would respect the privacy and amenity of the existing neighbouring residential properties which surround the site. Due to the constraints of the site and the surrounding residential dwellings, Bournemouth Borough Council’s expectations were extremely high and this resulted in a number of meticulous plan revisions in order to deliver the best possible scheme to this contentious site. Following a lengthy consultation and negotiation process involving numerous meetings between PTP, ARC and the council over the past three months, ARC and PTP have delivered a residential redevelopment of the site which the council have deemed ideal for this location and overcoming all of their initial concerns. The council recognises this sensitively designed proposal as an excellent opportunity to rejuvenate this vacant urban industrial site and provide much needed high quality accommodation in the form of 3 bed terraced and semi-detached housing and 1/2 bed modern apartments in a highly sustainable part of Bournemouth. As an added bonus, we were we able to convince the council to accept a zero sum transport contribution on site (saving of over £70k). In addition, once more with the help of Simon Corp (S106 Affordable Housing), a comprehensive viability report convinced the District Valuer that it would not be financially viable for the developer to pay any affordable housing contribution, resulting in a saving of £538k and an overall saving to the applicant of more than £600,000. The approved scheme will be a welcomed addition to the Pokesdown area creating a new residential development of high quality accommodation, ample parking and a high levels of garden amenity space for each dwelling whilst also safeguarding against any harmful impacts to the surrounding neighbouring properties on Seabourne Road, Cromwell Road, Wyncombe Road and Stourvale Place. The proposal will dramatically transform this section of Cromwell Road and breathe new life into the site which has laid vacant for many years. All in all, this large scale residential redevelopment scheme has been a successful collaboration between ourselves at PTP, ARC Architects and Section 106 Affordable Housing, in delivering a comprehensively designed and expertly negotiated and managed application from start to finish, which has resulted in a highly desirable proposal which the council consider to be the most suitable and attractive design solution for this once vacant and derelict site.